It begins with a tree. Start a blog, I told myself. Then you can write about anything you want. The idea was enticing, but the promise of writing about anything led very quickly to indecision and that led rather rapidly to no writing at all. Galaxies, immune cells, archaeological digs, neurons, human behaviour, string theory. Where to begin? Specialise, they say, and there is indeed wisdom in that. But part of the fun of this blog is the chance to explore, to tread new ground, to learn new things, to be amazed, puzzled, delighted, and to then share all of that. Indecision settled in and grew comfy. I became concerned. Was it really paralysing wonderment? Or was I just chicken? It’s hard to tell some days, but I suspect it’s a bit of both. I went for a walk to figure it out and on my way I saw a tree. I slowed. I stopped. I took a good look at this tree I’d passed many times before without so much as a glance. Standing there, it became quite clear that if you want to explore the entire universe, you can start quite close to home. This tree had a story. It was, quite literally, scribbled all over it. The markings were rough beneath my fingertips, the author nowhere to be seen. So this is how the Luminous blog begins: with the story of a tree that took me more than 180 million years into the past. The eucalypts grow everywhere around here. This is Australia after all. This neighbourhood was carved out of bushland, and farmland that had once been bushland. But the creeks and the catchments were mostly left alone. There’s a path that winds through. It’s a little bit wild in there, a bit dangerous. It’s marshy in some places, dry in others. Trees tower, some leaning precariously, ready to fall. The underbrush is dense and beautiful. Venomous snakes hide in the tall grass and bulbous spiders dangle patiently on expansive webs. Some of the wildlife are more benign. There are rainbow lorikeets, kookaburras, and brush turkeys. Recently, I spied a wallaby. It regarded me for a moment then hopped away, almost dismissively. It’s summer now, and the cicadas are singing. They chorus in perfectly synchronised waves, the crests of which are deafening. It thrums in your chest and drowns out the human world. The cicadas are here because they rather like the eucalyptus trees. And the eucalypts, in turn, have brought something else: tiny, elusive writers. Australia is home to several hundred species of eucalypt. And it seems a modest variety make their home in this narrow stretch of wilderness. One of the most curious is the Scribbly Gum. The name Scribbly Gum actually refers to a cluster of different eucalypt species found on the eastern seaboard of Australia. Their common signature, as it were, are the scribbles all over their pale, smooth-barked trunks. These markings have become something of a national icon, weaving their way into Australian folklore and literature. Of a life I could not read. The tiny writers are exquisitely shy, they leave their marks and vanish. They’re the elusive graffiti artists of the natural world. The work of beetles, was a common guess. Then, in 1934 the culprit was identified: a moth, scarcely a few millimetres big. A specimen was sent to England into the care of a school teacher named Edward Meyrick. Meyrick, himself, was a curious entity. An amateur entomologist, he had a remarkable hobby of describing, naming, and cataloguing insect species. Moths were a particular favourite. Over his lifetime, he bestowed carefully thought out scientific names to more than 14,000 of them. And so, with due care, he named this one Ogmograptis Scribula. Literally, the writer of the Ogam script. It’s said that he chose the name because the scribbles bore some resemblance to an ancient Celtic writing form called Ogam. There is also a second layer of meaning. Ogmos is not Celtic, it’s Greek; it means furrow – a groove or a narrow trench. When you look closely at the meandering lines on the scribbly gum, you’ll see that’s exactly what they are. For Meyrick, these strange patterns were unique. For all his expertise, his meticulous cataloguing of thousands of moth species, and his passion for taxonomy, Ogmograptis presented an enigma. Where it fit with all the other families, genera and species of moths, he couldn’t say. And so the story of the diminutive creature remained unreadable for many years. This was exacerbated by the fact that they are difficult to capture in the wild. In defiance of the wide reputation of many moths, Ogmograptis is not lured by light. The larvae are equally recalcitrant. They are so dependent on the eucalypt, they’re difficult to rear in captivity. In the 1990s, CSIRO entomologist Ted Edwards suggested that the scribbles are formed by the larvae as they mine their way through the bark, feeding as they grow, zigzagging, then doubling back. Still, it was thought there was only one species responsible. Moreover, the scribbles had never been quantified in detail. The math of these moths remained a secret. Then a unique collaboration set the little moth’s story on a new course. Julia Cooke was high school student who wanted to do a project on scribbly gum moths. Edwards had retired, but agreed to mentor Julia. So together they embarked on a study of the scribbles of three different species of eucalypt in the Canberra area. They measured everything they could. The height, the width, the length. The thickness of the furrow, the direction, the distribution. Were they on the north side of the tree, or the south? The east or the west? Were the paths random, or was there something more to it, an innate algorithm? How many zigs, how many zags? No matter where the scribbles were found, they each showed three clear stages. ‘A’ is the beginning, a very thin random scrawl that follows no rhyme or reason on any tree. ‘B’ is the thicker darker, zigzag, the tunnelling in earnest. ‘C’ is the loop – they all do indeed make a U-turn and follow the path back to the start of ‘B’. And yet, there were distinct differences. For each of the three species of eucalypt they studied, there were slight variations, particularly in the length of the furrow and, remarkably, in the number of direction changes. It was as if these scribbles represented different dialects. A new theory emerged. There wasn’t one species of scribbling moth, there were at least three, possibly more. This finding inspired a new endeavour, this time botanists and entomologists at CSIRO teamed up with geneticists and imaging specialists. Pairing field data with DNA analysis and scanning electron microscopy, they discovered that there are 14 different species of this tiny Ogmograptis moth, and that they can be divided into three distinct groups. Marriane Horak, one of the chief investigators, explains here in further detail in the Conversation. They were also able to achieve what Meyrick had been unable to. They now knew exactly where it belonged. Their analysis, particularly the high resolution images of the jaw, linked Ogmograptis with the Australian Tritymba moths and the African Leucoedemia moths. Together they form the southern group of a larger family called Bucculactricidae. The implication of the African connection is profound — it suggests they share a common ancestor who lived on the supercontinent of Gondwana, which comprised the land masses that eventually became the southern hemisphere continents of Australia, Africa, South America and Antarctica (Gondwana also included what is now the Indian subcontinent and the Arabian Peninsula). Indeed, Ogmograptis’ ancestor would have had a home; the recent discovery of a eucalyptus fossil in South America, contributes to strong evidence that eucalypts also have a Gondwanan origin. They seem to have thrived there, and where the eucalypts went the moths followed. It’s a hot day and I’m walking along the path with my young daughter. Over the song of the cicadas, I tell her to keep an eye out. Smooth bark, not rough, I say. Look for the scribbles. I see the tree first, but let her find it on her own. “There!” she calls out. The tree is tall and covered in Ogmograptis graffiti. I cannot tell how far up they go, they disappear into the brightness of the day. There must be thousands of them. We take a good look at the ones right in front of us. My daughter reaches out, picks a scribble that she has decided is the best, traces its path. It follows the pattern perfectly. The random thin scrawl, like a languorous, drunken scratch. Then the regular zigzags, where the larvae grow larger, gnawing through the cork layer. This is why it doubles back. It doesn’t just tunnel, it harvests. It’s a neat trick: the first pass wounds the tree; as the tree repairs itself, it produces a scar tissue – tiny, thin-walled cells full of nutrients. The larvae then does its best 180 — some species have a tighter turning circle than others — and eats its way back again. When it’s had its fill, it bores to the surface, finds its way to the base of the tree, pupates, emerges, and flies away. When the bark sheds, the scribbles are revealed. Somewhere around 180 million years ago, during the Jurassic period, the Gondwanan supercontinent split up. During this slow, tectonic tantrum Australia separated from Africa. Primates had not yet evolved. Dinosaurs roamed, and the world was still millions of years from the asteroid impact that would trigger their demise (well, not all of them, but that’s another story). Ogmograptis’ life cycle is annual, an evolutionary refinement in keeping with the yearly shedding of eucalyptus bark. The scribbles you see are this year’s scribbles. It is feasible, then, that the scribble my daughter has traced is at least the 180 millionth generation. Arguably more. It’s time to head back, the day is getting on and my fellow explorer wants lunch. We leave without finding the adult moth, though I didn’t expect to given its reputation for being furtive and so profoundly small. Its body is only 2mm long. It’s wingspan 10-12mm, if that. And yet what it has written, and left behind, is larger than it will ever be itself. And I think there’s poetry in that. Marienne Horak’s article in The Conversation outlines the findings of the 2012 paper, where she and her colleagues revealed the DNA analysis and detailed anatomy of Ogmograptis. Horak, M et al (2012) Systematics and biology of the iconic Australian scribbly gum moths Ogmograptis Meyrick (Lepidoptera : Bucculatricidae) and their unique insect–plant interaction. Invertebrate Systematics 26(4) 357-398. Cooke, J., and Edwards, T. (2007). 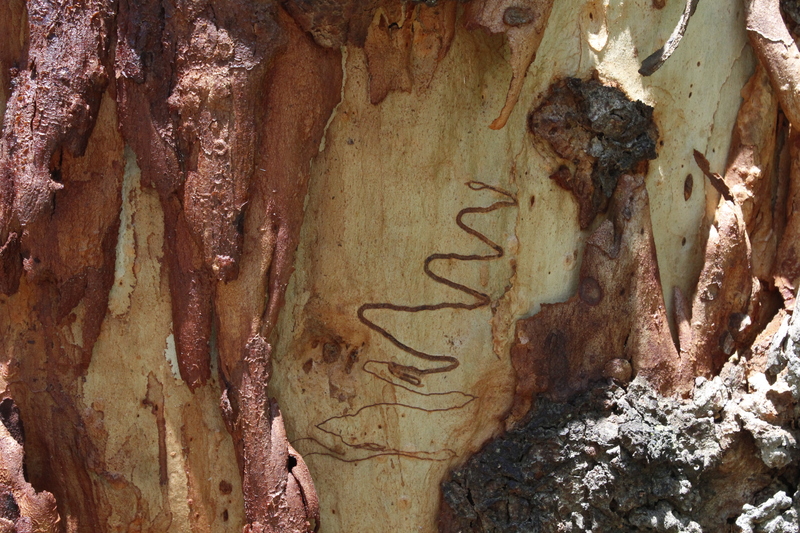 The behaviour of scribbly gum moth larvae Ogmograptis sp. Meyrick (Lepidoptera: Bucculatricidae) in the Australian Capital Territory. Australian Journal of Entomology 46, 269–275. Incidentally, Edward Merrick was a member of the Linnean Society of NSW, which is still active today. Fascinating! Thank you for writing this. Specific and interesting information woven with beautiful prose is the way I learn best. Love it. Keep writing! Saw this mentioned in the Weekend Australian and thought I’d look and see. Glad I did. What a lovely piece of writing. Thank you! So beautifully and simple homage of the wonderment of nature to us humans.